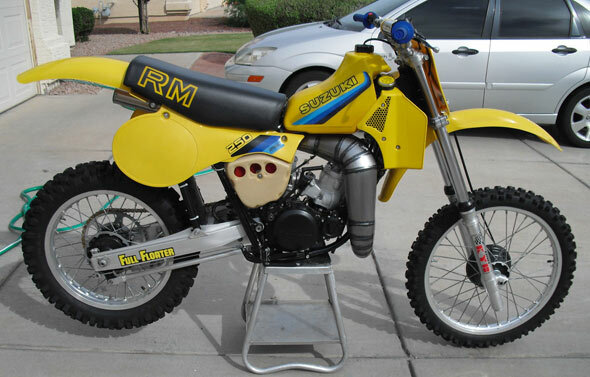 1982 suzuki rm 250.one of the best post vintage race bikes.this bike starts easy,is very fast and has great suspension. A lot of work has been done on this bike and here is a list. Motor: rebuilt bottom end-all bearings, clutch and seals.top end bored to 0.50 oversize, new reeds and Suzuki intake manifold.rare single sided air box with new filter, Jemco pipe and silencer. rebuilt carb, NOS kick starter. Suspension: new seal head,bumper and valving on rear shock.5.0 spring.84 rm 250 43mm forks with new seals and hd springs. Double leading shoe front brake from 84 rm 250.all new OEM cables and throttle assembly, Renthal bars and chain.tires like new.new chain buffers.all new swing arm bearings.new strut bearings, new heim joints in shock, new Suzuki OEM fenders, side panels and shrouds, front number plate is new OEM Suzuki, seat has heavy duty foam and new cover.tank is in great shape and has new graphics. Powder coated frame, shock spring, pegs and brake petal.